Our ultra-sharp blade cuts with minimum pressure, without tearing or damaging the specimen and reduces the risk of specImen distortion. The handle is made of titanium and is coated by high vacuum with titanium nitride to harden the surface. 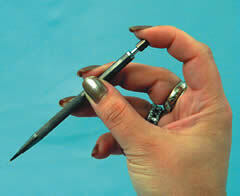 The knife is corrosion free and is completely resistant to saline solutions. It can be sterilized in an autoclave up to 200°C. If your diamond is damaged or broken, we can resharpen it or replace it and guarantee that the repaired knife will be of the same standards of perfection as the original.